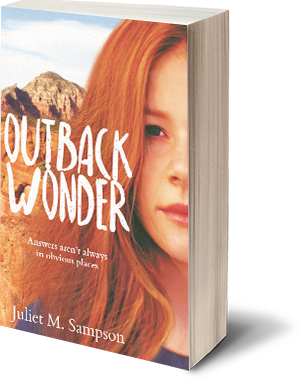 Outback Wonder by Juliet M Sampson is set in the Flinders Ranges where the stars shine brightly in the desert sky and the sun glows over the colours of the Australian Outback. You'll go on sunset tours with Hannah, the main character who meets up with the local bush pilot, Sam. Finding the spirit of the outback including Akubra hats, bush tucker and indigenious culture. You'll take a visit to Coober Pedy to open cut mines where you discover underground living, a cave restaurant and experience opals significant to the area. Sometimes you need to just wish on a shooting star! Love can come out of nowhere when least expected. Outback Wonder by Juliet M Sampson comes straight to you from the true heart of the Australian Outback. Find your right moment and happy reading! Contrary to her expectations Hannah finds in the Outback the perfect setting to rekindle old friendships and make new ones. The rising and setting of the sun, the starry skies, the silence and the dusty plains provide a perfect catharsis, a new outlook on life, and a decision to move on. May this book inspire those readers who are sitting on the fence, before they take that mighty leap, however big or small that life may bring. Outback Wonder follows the story of seventeen year old Hannah. After her parents' separation, she struggles with the fact her father walked out on her and her mother. She blames herself badly. At the beginning she is diagnosed with depression and I really felt for her. This drew me into the book straight away, as I too have been there (not with my parents separating. They are still together. With depression.) I hoped she would pull through. I often went through the same feelings when I was Hannah's age. Out of the blue, Hannah receives an email from her dad inviting her to spend some time with him in the Flinders Ranges. She is reluctant to go at first, but she finally accepts. From here, we are thrust into a great journey of not only self discovery, but descriptions of the beautiful Australian bush. Juliet paints a vivid image of Lake Eyre and the outback. I could imagine myself being there. Hannah meets Sam, a cute young pilot. I loved reading about their budding romance, and I had hoped to read more about Sam and Hannah when he came to Adelaide. But Juliet leaves room for your imagination to go on an adventure of its own. I really enjoyed Outback Wonder and recommend it to all lovers of Young Adult fiction.